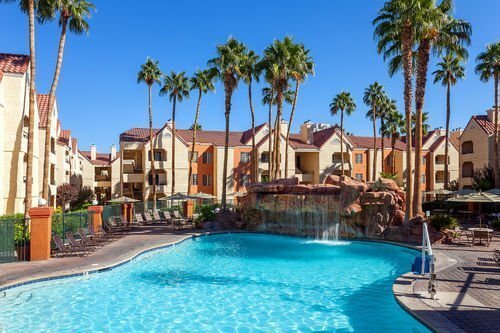 The Holiday Inn Club Vacations Las Vegas – Desert Club Resort, 3950 Koval Lane, is a well-designed luxury resort, which lies just outside of Las Vegas. The Holiday Inn Club Vacations Las Vegas – Desert Club Resort, is a well-designed 19.5-acre luxury resort, which lies just outside of Las Vegas. 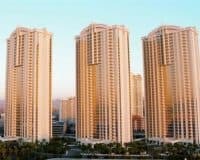 This means alongside all the fabulous things that the resort offers on-site, lucky guests are under 3 kilometers away from the heart of the Vegas Strip. 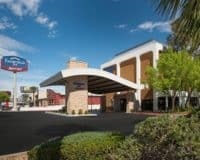 It is also close to McCarran International Airport, making it a great choice for people who want to have a relaxing holiday in the entertainment capital of the World. The amenities at the resort are family-friendly, providing hours of fun that the entire family can enjoy. For the young at heart there is mini-golf and a great games room, along with five separate heated swimming pools, meaning everyone, from those who want to relax to those who want to splash about in the Nevada sun, are assured of a good time. The resort also hosts two fitness centers and a remarkable five hot tubs, alongside a plethora of great restaurants offering various cuisines from around the world. Every lodging in the hotel is a stylish suite, featuring a fully equipped kitchen, lounge area, and television, with its own fireplace attached and washer and tumble dryer, meaning guests can make themselves completely at home. The Holiday Inn Club Vacations Desert Club Resort, is the ideal Vegas destination for families, providing something for everyone, while being far away enough from the center of town, that children won’t get sucked into the craziness that is often associated with Sin City. 1 block from the Las Vegas Strip. 25 miles from Death Valley. 17 miles from Red Rock Canyon.